The Baros Nooma Cruise take amazing Maldivian sunsets to a whole other level. No matter how they described the boat, I did not expect something as cool as this! 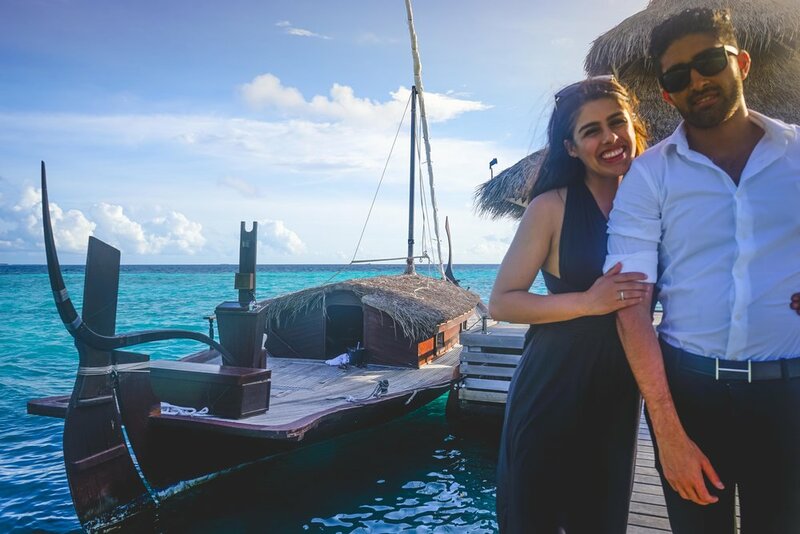 After our first day at Baros was winding down, we found ourselves lounging at the very romantic outdoor bar with champagne in hand from the Nooma sunset sailing cruise we were just on. Our butler during our stay approached us wondering if we had looked over the menu for the sandbank breakfast. We guiltily let him know that we hadn't and he smiled understandingly and came back within a few minutes, menu in hand. The menu looked extraordinary, but not a typical breakfast. It included a cold cut and cheese platter, shrimp cocktail and smoked salmon, pastry and danish selection, mango yogurt, and a fruit platter. I let him know that we probably wouldn't eat the yogurt and that juice or a smoothie would be good for me. Kambiz mentioned that an addition of eggs would be great. He said he would check with the chef and Kambiz and I looked at each other in surprise wondering if we were asking for too much. The executive chef and our butler arrived shortly to clarify the request for a smoothie and eggs. We nodded and he said that it shouldn't be a problem; that he has an idea. 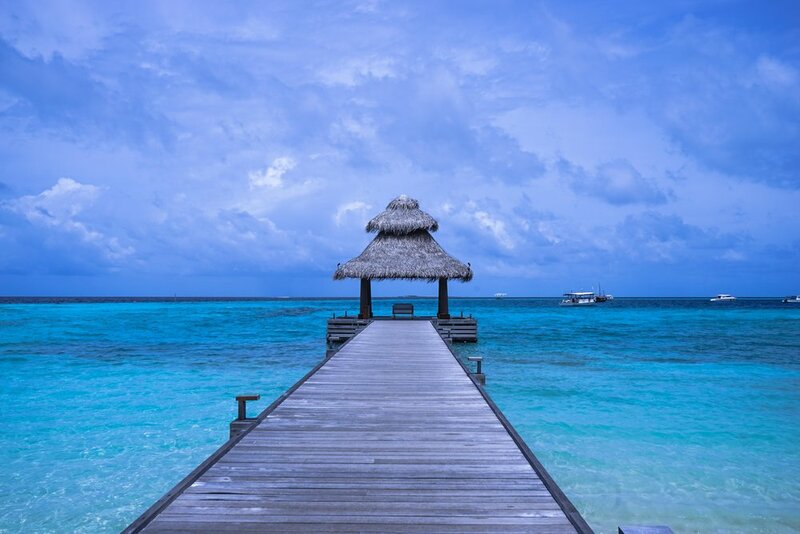 Best dock award goes to Baros- so beautiful! Equally amazing looking the other way! The next morning, we arrived eagerly to the beautiful dock that I took a picture of every time I went past it (it's that beautiful) to the boat that would be taking us to the private sandbank for breakfast. Coming up to the sandbank felt too good to be true. I couldn't believe how beautiful the crystal clear lagoon was and the dreamy mini island. Amazing 360 degree views happen here. I’d live here if you let me! We were shown to our table and I was actually in heaven. My favorite meal of the day on a private island with the most accommodating and polite waiter; my bucket list hadn't even imagined something this good and here I am checking it off. We also were introduced to the chef who was brought onto the island to cook us eggs. What?! Just from our request? I felt like a crazy princess demanding extravagant things like eggs on a private island. I understood why the menu was all cold items now and my eyes were huge with amazement of their service, as they acted like it wasn't a big deal at all. You should have seen my face looking at this meal. The smile was huge. Keeping it cool, but my mind is exploding. The table full of food was squeal worthy and I knew it was only right to enjoy every minute of it. Crispy croissants, fresh mango juice, and a beautiful bagel with smoked salmon, scrambled eggs and a bite of cream cheese filled us up- too quickly in my opinion. I could have been satisfied sitting there all day picking away at the feast. As I thought about how satisfied and content I was, a speed boat arrived and a platter of two smoothies were handed to our waiter. My eyes were now even bigger than before as I asked Kambiz, "Could that be the smoothie I asked for?". I felt like digging a hole and jumping in, not used to this specialized treatment. What a start to a beautiful day in the Maldives. Snorkling is next on the agenda. We spent the last few hours running around like five year olds because I'm not sure what else you are suppose to do when you have an island to yourself. And as we left the beautiful island, I couldn't help but think that this incredible experience would be hard to top.